#1 Retail Pickle Brand in Canada*. Want to add some custom crunch to your menu? 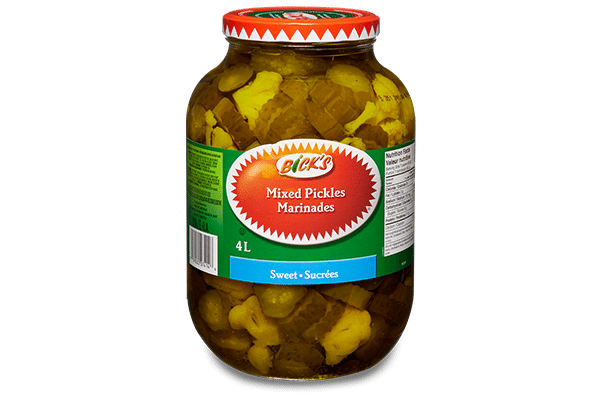 Satisfy your customers’ cravings for condiments with the perfect pickles and products from Bick’s®. Choose from our signature Baby Dills, pickle slices, hot peppers, variety of relishes and specialty products. The perfect blend of cucumbers, cauliflower, & onions, in sweet pickled brine. Ingredients: CUCUMBERS*, SUGAR/GLUCOSE-FRUCTOSE, CAULIFLOWER*, WHITE VINEGAR, WATER, ONIONS*, SALT, CALCIUM CHLORIDE, SODIUM BENZOATE, POTASSIUM SORBATE, SEASONINGS, SULPHITES, COLOUR (CONTAINS TARTRAZINE), POLYSORBATE 80. *PROPORTIONS MAY VARY. MAY CONTAIN MUSTARD INGREDIENTS. The perfect serrated cut for excellent visual attributes, adds a custom touch to your signature dishes. Ingredients: CUCUMBERS, WATER, WHITE VINEGAR, SALT, CALCIUM CHLORIDE, SODIUM BENZOATE, POTASSIUM SORBATE, SEASONINGS, POLYSORBATE 80, TARTRAZINE. MAY CONTAIN MUSTARD INGREDIENTS. Uniform, thin cut, pickle slices, that add zing to any sandwich, burger, or salad. Great garlic flavour is captured in small pickles which are chosen for their perfect crunch. Ingredients: CUCUMBERS, WATER, WHITE VINEGAR, SALT, CALCIUM CHLORIDE, SODIUM BENZOATE, POLYSORBATE 80, SEASONINGS. MAY CONTAIN MUSTARD INGREDIENTS. Straight cut sweet pickle slices, fresh from the field to the jar, comfort food in a jar. Ingredients: CUCUMBERS, SUGAR/GLUCOSE-FRUCTOSE, WATER, WHITE VINEGAR, SALT, CALCIUM CHLORIDE, SODIUM BENZOATE, TARTRAZINE, SEASONINGS. MAY CONTAIN MUSTARD INGREDIENTS. Whole medium-large sized Kosher Style Dill Pickles with the delicious sour taste of a deli pickle. Ingredients: CUCUMBERS, WATER, WHITE VINEGAR, SALT, CALCIUM CHLORIDE, SODIUM BENZOATE, POTASSIUM SORBATE, SEASONINGS, POLYSORBATE 80, TARTRAZINE, TURMERIC. MAY CONTAIN MUSTARD INGREDIENTS. Pickled to perfection these medium-large sized whole pickles offer the delicate flavour of dill weed. Small whole pickles sweetened to perfection with classic gherkin flavour. These sweet little treats are an excellent addition on any buffet or salad bar. Ingredients: CUCUMBERS, SUGAR/GLUCOSE-FRUCTOSE, WHITE VINEGAR, SALT, WATER, CALCIUM CHLORIDE, SODIUM BENZOATE, POLYSORBATE 80, COLOUR (CONTAINS TARTRAZINE), SEASONINGS, TURMERIC. MAY CONTAIN MUSTARD INGREDIENTS. A unique and exciting condiment that dresses up burgers, or use as a salsa over meat dishes. Ingredients: CORN, WATER, SUGAR/GLUCOSE-FRUCTOSE, WHITE VINEGAR, MODIFIED CORN STARCH, SALT, DEHYDRATED ONIONS, SPICES (MUSTARD) AND SEASONINGS, DEHYDRATED PEPPERS, GARLIC POWDER, POLYSORBATE 80, TARTRAZINE. Traditional style of sauerkraut that is fermented and pasteurized. Wine is added for a smooth distinctive flavour. Ingredients: CABBAGE, WATER, SALT, WINE, SULPHITES. A cost effective relish which offers taste and quality. Ingredients: CUCUMBERS, WATER, SUGAR/GLUCOSE-FRUCTOSE, WHITE VINEGAR, MODIFIED CORN STARCH, SALT, CALCIUM CHLORIDE, POTASSIUM SORBATE, SODIUM BENZOATE, POLYSORBATE 80, SEASONINGS, COLOUR (CONTAINS TARTRAZINE). MAY CONTAIN MUSTARD INGREDIENTS. Zesty seafood sauce made with fresh horseradish and rich tomato flavour complements. Ingredients: WATER, TOMATO PASTE, SUGAR, HORSERADISH, WHITE VINEGAR, VEGETABLE OIL, SALT, MODIFIED CORN STARCH, SEASONING (SULPHITES), LEMON JUICE, CITRIC ACID, ARTIFICIAL FLAVOUR, XANTHAN GUM, POTASSIUM SORBATE, SODIUM BENZOATE. A mixture of red, orange and yellow hot banana peppers make this product perfect for pizzas, pastas, subs. Ingredients: BANANA PEPPERS, WATER, WHITE VINEGAR, SALT, CALCIUM CHLORIDE, SODIUM BENZOATE, SEASONINGS, SULPHITES, POLYSORBATE 80. MAY CONTAIN MUSTARD INGREDIENTS. We grind fresh horseradish and make them in small batches to ensure optimal flavour. Ingredients: HORSERADISH, WATER, WHITE VINEGAR, VEGETABLE OIL, SUGAR, SALT, XANTHAN GUM, COLOUR, SODIUM BENZOATE, SULPHITES, ARTIFICIAL FLAVOUR. Whole baby beets, pickled to perfection, a colourful way to dress up a plate. Ingredients: BEETS, WATER, WHITE VINEGAR, SUGAR/GLUCOSE-FRUCTOSE, SALT, SEASONINGS, POLYSORBATE 80. Most popular pickled beet in Canada! Uniform straight cut beet slices.